Scallops are my favorite food in the whole world, and I've probably made them at least 1500 different ways, but for the life of me, I cannot imagine HOW you would stuff a scallop! Both scallops and shrimp can easily be overcooked, so beware. You don't want to end up with rubbery food. Here are two easy and delicious ways to fix each shrimp and scallops. and yes, you could exchange the protein for the other in each dish. When I was a little girl growing up in Chicago, one of the great treats for me was when Aunt Betty Low took our family to San Pedro¹s (in NoMansLand) for Shrimp de Jonghe. As an adult, I recreated the dish, but it wasn¹t until recently that I learned it is a regional specialty, unfamiliar to people from other parts of the country. So here for your dining pleasure (and it IS a pleasure!) is Shrimp de Jonghe. 1. Cream together butter, salt and garlic. Mix the bread crumbs, parsley, sherry, pepper and paprika with the butter mixture. 2. Put the shrimp into boiling water. Cover and remove from heat to remain only until they turn pink. Rinse with cold water and drain. 3. Preheat oven to 375 degrees F. Butter 4 to 6 individual ovenproof dishes, or one large casserole dish. 4. Divide shrimp among casserole dishes. Mound crumb mixture on top. Bake 20 minutes or until crumbs are golden brown and sizzling. Teacher’sTip: Because this is so unbelievably rich, Shrimp de Jonghe doesn’t want much in the way of accompaniment. A simple salad with a vinaigrette or a plain-but-perfect green vegetable along with enough crusty bread to sop up ALL the sauce ­ will be PERFECT! Wine Tip: The richness of Shrimp de Jonghe lends itself naturally to an elegant Chardonnay. I’d suggest a Meursault. 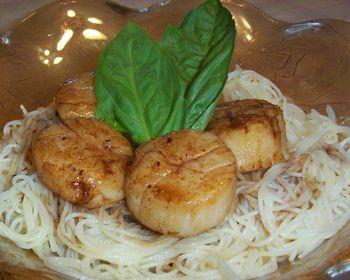 Scallops are my favorite food, and this is my favorite way to prepare them. The recipe is courtesy of Chef Sulim Tomás—“Tommy”, when he was chef of the long-gone Half Shell restaurant in Boston. Be careful not to buy watery scallops. The water indicates that they¹ve been treated with chemicals to keep them fresh. These chemicals will make them taste like soap suds. Not the flavor you¹re looking for. 1. Poach onions in broth until translucent and soft, but not mushy. Add scallops to the simmering liquid and turn it off. Let the scallops sit in the liquid with the onions until they are cooked. (It’s important not to overcook the scallops or they will become rubbery. 2. At the same time, melt the butter in a sauté pan. Sauté the mushrooms in the butter until they are brown. 3. Preheat the broiler. Place the scallops and onions in a shallow ovenproof dish. Top with the mushrooms, fresh herbs, and salt and white pepper to taste. Sprinkle the sherry over. Broil close to the heat source for about 2 or 3 minutes, until browned and bubbly. Teacher’sTip: 1.Serve over a pilau of brown and wild rice or saffron fettuccine. Wine Tip: My favorite wine with this dish is Les Fourchaumes, a Premier Cru Chablis from Domaine Laroche. Chef June, couldn't help but notice and ask re the teacher's tips, wine suggestions, story about an aunt, and recipe courtesy of, and different fonts - have you made these recipes - as they appear to be copied and pasted, imo. Who is the "Teacher" & are these your Tips? Amy: yes, I am the teacher, and they are copied from the manuscript of my cookbook, Feastivals Cooks at Home. I can post them because I hold the copyright. Yes, I have made these recipes MANY times, each! I bet you could stuff this shrimp, or maybe these, or even these! Thank you, thank you, thank you everyone. Ya'll are the best! I've copied and printed all the great recipes to take with me tomorrow. I really appreciate all the detailed directions and tips. It's been such a problem for me over the years since I was never taught to cook growing up or ever able to observe others cooking, much less have direction from fabulous (even professional) cooks. I can't tell you how much better the meals at my house have gotten since I joined DC. I will definitely let ya'll know how my shrimp and scallops turned out when I get back. Sorry June. Give our regards to Aunt Betty. It’s something of an oxymoron to say “large shrimp” isn’t it? I don't think anyone questioned the ability to stuff shrimp. It was scallops that seemed unlikely. With a smaller 25-30 count scallop, stuffing might be a problem, but with the larger ones, I don’t see why you can’t stuff it the same way you do a pork loin chop. Juts make a slit in the side, move the knife around to create a cavity, then you could fill the cavity with a duxelles. Wait, wait keltin. You're getting way out of my league. What's a duxelle? A duxelles is a combination of mushrooms, onions, shallots, and herbs, all finely chopped and sautéed in butter. It’s a basic starting point for many stuffings and sauces. The simplest stuffing would be to just add bread material and stock. Fancy word for something so simple huh! Thanks! The name actually makes mushrooms and butter sound even more delicious than they already are.